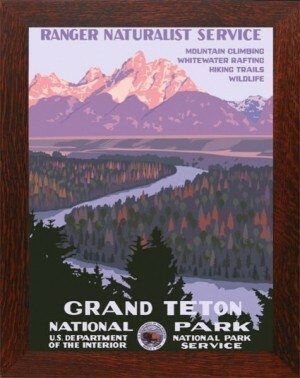 Grand Teton: United States Travel Bureau poster was created in 1938 as part of the Works Project Administration (WPA) Federal Art Project. This poster has been faithfully reproduced by a team of artists. Using an original poster, every detail was reproduced to create the highest quality poster available. Heavy stock paper was used to produce a non-reflective matte finish for a look and feel of the original silk screened posters. Shown framed in our "Oak Park" quarter sawn white oak, with an overall dimension of 21" x 27". Also available unframed. NOTE: Due to the hand-crafted nature of these framed posters , expect delivery in 1-3 weeks.